Nebraska State Sen. Tanya Cook made history some years ago when she and Brenda Council became the first African-American women to serve in the Nebraksa Legislature. Council is no longer in office but Cook is still there, fighting the good fight for her District 13 constituents. A well-traveled woman in terms of politics and geography, she served as an official observer of the May 25 Ukrainian presidential election. Her reflections about that experience are the core content of this short story for Omaha Magazine (http://omahamagazine.com/). An abiding curiosity led Neb. 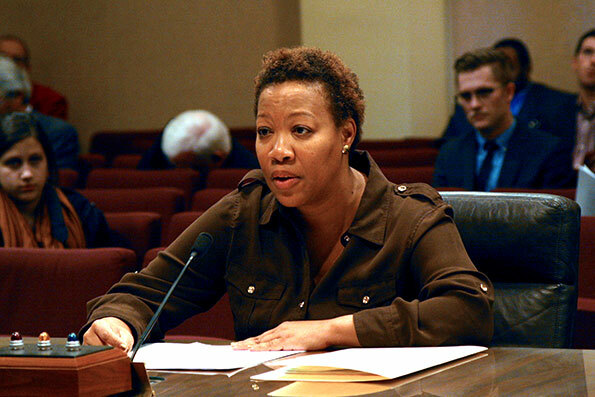 State Sen. Tanya Cook (District 13) to serve as an official observer at the May 25 Ukrainian presidential election. Cook often travels abroad to feed her wanderlust. Her week-long stay in the former Soviet satellite state provided an opportunity for enlightenment and service. With Ukraine’s fragile union threatened by separatist uprisings and Russian expansionism, the election was a moratorium on democracy and autonomy. The lifelong Democrat has worked with municipalities as a public relations consultant and for eletcted officials as a campaign and administrative staffer. In 2008 she and Brenda Council became the Unicameral’s first black women legislators. Born in Guam to an Air Force family, Cook grew up in Omaha in the 1960s and ’70s. Her parents were from the South, where she says “the ability to take part in elections was something they didn’t take for granted.” Despite being a teacher, her mother was forced to take a literacy test in order to vote. Her father became a teacher following his retirement as a military civil engineer. Ukraine’s strategic importance in a region where borders and allegiances are in flux appealed to her geo-political focus. and in (Russian premier Vladimir) Putin not reconvening the USSR,” she says. Assigned to seven polling places in Kiev, Cook witnessed large voter turnout and typical election snafus (long waits) but saw nothing amiss. The “earnestness” of election officials and voters impressed her. She says the popular Poroshenko clearly “emerged as a leader who would stand up to” Putin’s interventionism.